Trombone mutes are musical attachments that alter the sound of the trombone. They temporarily alter, warm, soften, or reduce the trombone’s tone to produce the specific, desired sound. Although most any solid object can be used to mute a brass instrument, the most common trombone mutes in use are straight, cup, harmon, bucket, plunger, and practice mutes. Most commercial trombone mutes either insert into the bell and stay in place by friction (like the straight, cup, or harmon mutes) or attach to the outer bell by clips (like the bucket mute). The plunger mute is a notable exception. Because it remains in the player’s left hand, the trombonist must be held in place over a specific portion of the bell to produce the desired tone. Early mute manufacturers used reinforced cardboard and polyurethane to produce the trombone mutes. These processes remain a standard composition for today’s entry-level products. As America’s Industrial Age improved manufacturing processes and techniques, mute manufacturers adopted processes including casting, metal spinning, woodworking, and injection molding. Several decades later, they added new materials such as fiberglass, aluminum, copper, brass, copper, ABS, polystyrene, and carbon fiber. The finest modern mutes are comprised of either independently-spun metal halves or specially-engineered fibers. Metal mutes made by this process are made significantly more superior if joined by crimp-free connections. These two constructions offer trombonists the best and purest sound that professional musicians demand. Mutes inserted into the trombone’s bell utilize segments of cork to help retain the mute inside the bell. 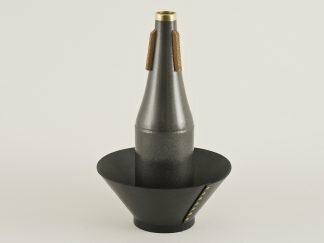 In an effort to prevent the mute from falling, some musicians who use these products elect to file and individually shape their mute’s cork segments to better match their bell’s interior surface angle. Soulo Mute, however, uses a superior blend of shaped cork and neoprene to effectively lock the mutes inside the bell. It designed its products with ingenuity, to prevent professional trombonists from experiencing the inconvenience of losing their mutes during performances. Straight mutes for trombone are the most common mutes found in an accomplished trombonist’s case or gig bag. Although most at-home in classical settings, early jazz musicians used straight mutes before other designs became more prevalent. A variety of materials and manufacturing processes allow straight mutes to be made from metal, wood, reinforced cardboard, and plastic. The most desirable, bright, and piercing sound are produced by metal straight mutes, while those made with reinforced cardboard, plastic, and wood offer a dull, inferior sound. Straight mutes insert into the trombone’s bell and stay in place due to three cork “spacers” evenly distributed around the mute’s upper cone. These spacers allow the trombonist’s air to flow partially around the mute, which reduces the backpressure they experience. Before they can be used reliably, however, most trombone mutes with cork first require the musician to create condensation on the bell’s interior surface by breathing into the bell. This light amount of moisture helps the cork spacers to keep the mute in place. Made by professional musicians for professional musicians, SouloMute utilizes the most advanced technologies to create the Soulo Straight Mute SM6525. Unlike entry-level products, these professional trombone straight mutes are firmly held in place by a blend of neoprene and shaped-cork. This feature helps ensure the mutes never escape during your auditions or performances, which also protects your investment for the life of your playing career. 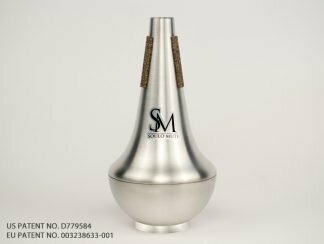 SouloMute’s patented trombone straight mute design features an independently-spun aluminum top and bottom, which is then joined by a secure “crimp-free” connection. This revolutionary process of joining the parts together leads to two very important benefits, both of which very appreciated by the trombone players community. By not using the extra material needed for the crimped connection, it creates mutes that are easily the lightest trombone straight mutes. When you play a large instrument like the trombone, you don’t want to add any more weight to it. The “crimp”, the bulky metal sticking out of the inside and outside of the mute, also creates obstruction for the airflow. The lack of obstructions lets the air flow freely, therefore allowing great projection without resistance. Trombonists also commonly use cup mutes. While they appear to be straight mutes with an additional bowl, or ‘cup,’ at the end, cup mutes produce a mellow, fun, and more distinct sound. Like straight mutes, cup mutes are inserted into the trombone’s bell and held in place by three corks evenly spaced around the mute’s upper cone. Trombone Cup mutes are sometimes used in classical pieces, but appear much more commonly in jazz. Humes & Berg created the first cup mutes and made them with fiber material. These early mutes offered excellent sound, but no adjustability, inconsistent pitch, and substantial airflow resistance. Most modern cup mutes are now made of modern materials like fiberglass, ABS, polystyrene, aluminum, and wood. Many professional musicians complain that metal and plastic cup mutes fail to replicate the authentic “cup” sound created by the original Humes & Berg model. The Soulo Cup Mute offers musicians the traditional cup sound they desire, but its industry-leading materials and design features offer unmatched playability. As with all Soulo Mutes, these produce an absolutely perfect pitch and precisely replicate the traditional cup sound because they’re comprised of specially engineered fiber. Soulo’s consistent, high quality manufacturing process allows professional musicians to confidently use the specific tone modification they intended. Like the straight mute, the Soulo Cup Mute uses neoprene enhanced cork. They confidently secure the mute inside the trombone’s bell without first adding condensation to the bell’s interior surface. 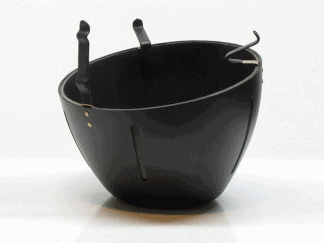 Soulo Cup Mute is also the only adjustable fiber trombone cup mute. A specially designed flange secures the cup while handling or removing the mute. It also allows the musician to produce a variety of tones. 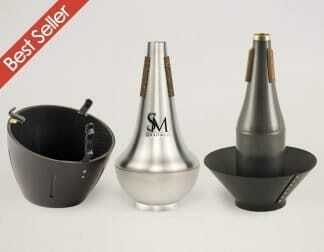 Once removed entirely, the SouloMute Cup Mute can also double as a straight mute. This offers an economical solution for high school and college students and educators who need both a cup and straight mute. 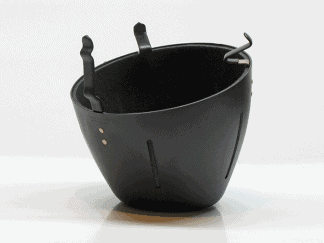 Bucket mutes offer a muffled, velvety sound. This reduction in volume allows musicians to play smaller or more serene venues. Unlike other, inserted mutes, external clips secure most bucket mutes to the trombone’s exterior bell. This allows a more free-blowing experience than other mutes. Very little resistance or backpressure is created, which allows trombonists to comfortably use bucket mutes throughout a gig or performance. Soulo Mute designed its bucket mute for tenor and bass trombone with flexible, adjustable brass clips. They are coated to protect the instrument’s surface and adjustable to fit on several bell sizes. The also offer two adjustable settings, an Open and Close position, which lead to two different tones. Professional trombonists use this feature to better blend with other players or their section, who may be using other brands. The Soulo Bucket for trombone is also the lightest trombone bucket mute available, which is important during extended sets. Trumpeter Miles Davis popularized the harmon style mute many decades ago and its sound remains almost exclusive to jazz. Sometimes called a “wah-wah” mute because of their tone, trombone harmon mutes fit inside the bell and divert all airflow into the mute. Unlike straight and cup mutes, harmons generally feature a wide strip of cork. That cork encircles its top and creates an airtight seal with the interior bell. This creates substantial resistance and requires significantly more effort to perform with it. Harmon mutes, including those made for the trombone, traditionally suffer from several design and performance issues. The combination of their weight and cork-friction attachment method means most of them have numerous small dents from falling during performances and auditions. Most harmon mutes cannot offer consistent pitch in the lower register and are difficult to play for extended periods of time. Plunger trombone mutes are just about what you’d expect from their name. Due to the size of various trombone bells, the player uses the thick rubber base of a toilet plunger to alter the instrument’s tone. While holding the mute in their left hand, the trombonist covers differing portions of the bell to create a diverse range of tones. Like cup mutes, plungers are used almost exclusively in jazz. Trombone practice mutes are typically used whenever a musician must play discretely and are not intended for performance. Practice mutes are an excellent option if a trombonist needs to practice or warm-up without disturbing others. They are great when practicing in a hotel, apartment building, or back-stage prior to a performance. Because they reduce the bulk of the player’s produced sound, these mutes create high-resistance to the musician’s airflow and are typically uncomfortable for extended practice sessions.